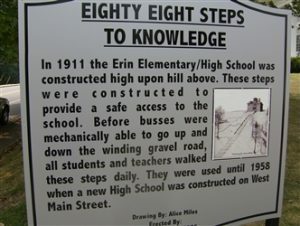 The “88 Steps to Knowledge” were the concrete steps that lead from Main Street to the Erin High School. Most of the older generations in Houston County would use these step going to and from gym class each day. When you get a chance, step to the top and see the wonder work this class did… there is a bench at the top to rest before you have to come back down. The Leadership Houston County Class of 2005-2006 completed a renovation of the steps. In the spring of 2017, the local Boy Scout Troop spent a day cleaning the steps and planting flowers.